Do you listen to podcasts? I first got hooked through NPR's This American Life and then Serial, but started expanding my regulars once we moved to San Francisco. Between walking our dog, my commute (part bus, part by foot), and running errands (typically by foot), I found I didn't always want to listen to music. With podcasts I'm entertained and often learning something new. See below for my favorites. I'd love to hear about any of yours so let me know in the comments. 1. Vogue Podcast: Hosted by André Leon Talley, the podcasts discusses the latest issue of Vogue and features the one and only Anna Wintour from time to time, along with Vogue editors and other magazine contributors. 2. Happier with Gretchen Rubin: I loved Rubin's book The Happiness Project so knew I'd be into the podcast, which talks about habits and tricks to live a happier life. 3. 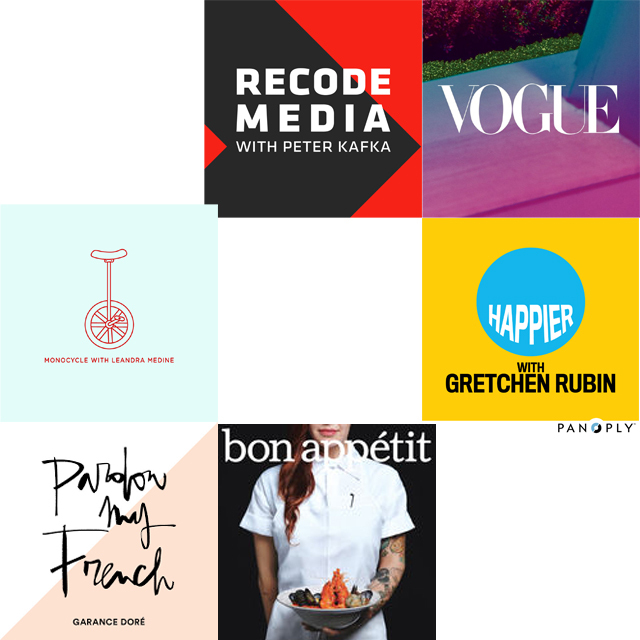 Bon Appétit Foodcast: I don't typically read food magazines, despite being someone who looks forward to my subscriptions arriving each month, so it surprised me how much I like this podcast. It features interviews with chefs, food writers, and is hosted by Adam Rapoport, Bon Appétit's editor in chief. 4. Pardon My French by Garance Doré: I've been reading Garance Doré's eponymous website for years and loved her book so I knew I'd enjoy her podcast and I was right. The podcasts are longer than most, but I find her French accent soothing. This is my go-to for early morning dog walks. 5. Monocycle with Leandra Medine: Similar to the above, I have been reading Leandra Medine's Man Repeller for years also loved her book, so it's not surprising that I enjoy her podcasts. The episodes are short, sweet, and funny. 6. Recode Media with Peter Kafka: Most of my podcasts are purely for fun, but I do throw a few work-related ones into the mix. My favorite media-related podcast is this one, in which Kafka talks to interesting people in media and technology. Honorable mentions go to Social Mediocre, Lena Dunham's Women of the Hour, and 2 Dope Queens. I am not sure why but I can never get into podcasts. I think because I am such a visual person. But I've of course heard so many good things about some of these ...the Vogue one sounds awesome. Give it another try Jaime! So many great ones now.